A tour of the incredible garden beds and techniques at Evergreen Brick Works. 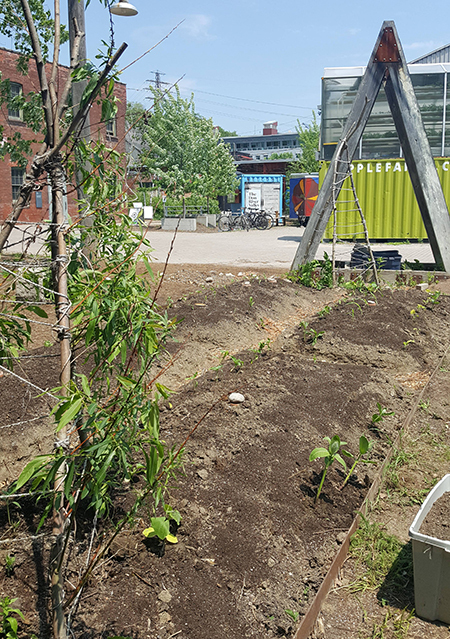 The leaves in the Don River Valley may be turning red and yellow, but plants are still blooming in the Indigenous Urban Agriculture Garden at Evergreen Brick Works. One grey morning, we caught up with Isaac Crosby, Lead Hand in Urban Agriculture at Evergreen, to walk us through the many gardens he tends at Evergreen Brick Works. “It is time for my gardens to go to bed,” he says while strolling past a wilting section of one of many gardens at Evergreen Brick Works. But some veggies like cabbage, cauliflower, broccoli, Swiss chard, kale, radicchio and Jerusalem artichoke are still producing. In fact, after the first frost, Crosby says that kale tastes much sweeter. We pass the raspberries experiencing a second bloom as he explains the process for adding compost into the ground before winter. “I still have beans, all the beans are left over and what I’m doing is letting the whole vine die down and dry so that we have the seeds for next year,” he says, adding that 90% of his seeds are from the previous year. These bountiful beds started modestly three years ago and have grown steadily each year. Crosby focuses on growing plants and food native to this region, like New England asters, turtleheads, wild columbine, marigolds, black-eyed and brown-eyed Susans. Some beautiful purple flowers are still in bloom and Crosby identifies them as Echinacea, casually mentioning that he planted them with Nelly Furtado. “I come from an Indigenous background with the Anderdon Ojibwe of south-western Ontario,” he said. There are many variations of Three Sisters that are used in First Nations’ communities but they all involve different versions of a symbiotic relationship between three veggies. Crosby says the trio can be: corn, beans and squash; sunflower, beans and squash; or sun root, beans and squash. Crosby explains how the technique works. Through the leaves and stem, the beans pull nitrogen from the air and stores it in the roots called nodules. This feeds the corn which helps the corn grow tall, bringing the bean stem higher with it. They are happy together but the ground around them can get too hot, weeds can gather to steal resources and rodents and other animals will help themselves to the plants. Squash leaves are large and shelter the soil keeping the ground cool and warding off weeds. But the leaves and stems also have little barbs that deter the critters from trying to nibble the plants. 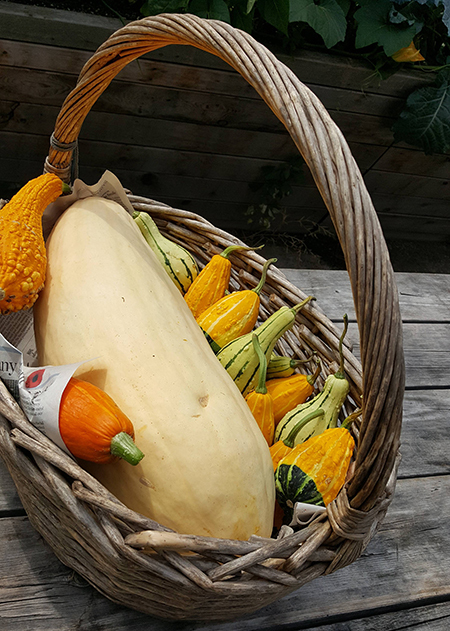 Each Three Sister technique accomplishes something different, and Crosby utilizes the sunflowers, beans and squash in the Indigenous Agriculture Garden on-site. After years of industrial use in this area, reclaiming the soil to a healthy state is an important step in revitalizing the Don River Valley Park. 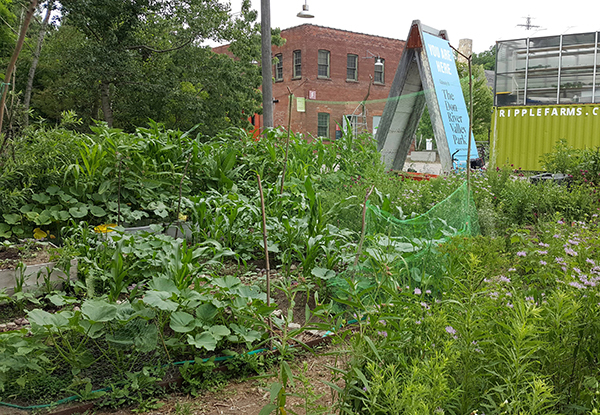 Indigenous Urban Agriculture Garden in bloom. Photo: Isaac Crosby. Peaking up from the ground is Crosby’s clay pot irrigation system. Terracotta pots are permeable and act as a natural gauge for the water levels in the soil. Gluing two clay pots together around the lip of the pot, burying the enclosed form and filling it with water creates a self-watering garden for seedlings. Early season sprouts. Photo: Isaac Crosby. Found in a small bed in Tiffany Commons is the medicine garden culminating with a striking cedar in the middle. Originally designed with Toronto Council Fire Native Cultural Centre, the garden is planted with the four sacred medicines of the Anishinaabeg: Giizhikaandagoons (cedar), bashkodejiibik (sage), bashkodemashkosiw (sweetgrass) and asemaa (tobacco). The garden was planted to benefit local community members through harvest, use and teaching. Traveller tomatoes. Photo: Isaac Crosby. As we pass the ‘Last Chance for Romance’ garden – a flourishing tub full of veggies saved from the garbage and given a chance to thrive – Crosby directs us to an unassuming tomato plant. “This you must know,” he says as he plucks a lumpy, unripe tomato from a vine. 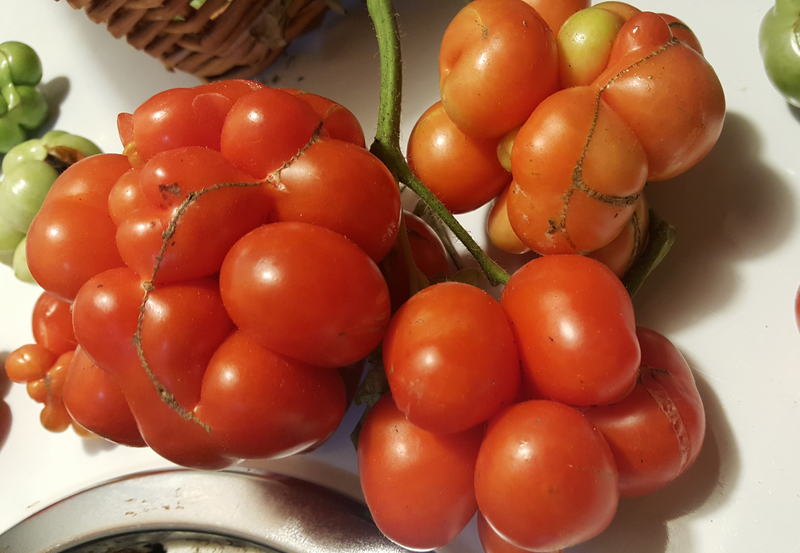 One tomato looks like a cluster of grape tomatoes. It's stories like these that make it easy to get lost in these gardens. Crosby also shares plans for next year’s growing season, including plans to grow an amaranth, a bright and colourful ancient grain.